Virat Kohli-led team India registered a comfortable win against Sri Lanka on day four of the first test on 29 July taking 1-0 lead in the three-match Test series at the Galle International Stadium. Spin duo of Ravindra Jadeja and Ravichandran Ashwin bagged three wickets each. Chasing a huge target of 550 runs to win, Sri Lankan opener Dimuth Karunaratne fell just three-run short of a century as he struck a blistering 97-run knock, including nine boundaries, to provide his side with a perfect start. However, after Karunaratne's dismissal of an Ashwin delivery, stumper Niroshan Dickwella (67) was the only one to provide some resistance before Sri Lanka collapsed for 245 in their second innings. 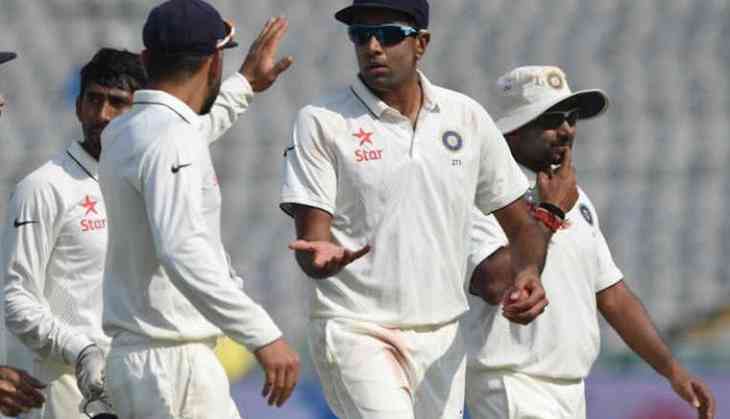 Ashwin was the pick of the bowlers, finishing with superb figures of three for 65. Jadeja snared three wickets for 71. Mohammad Shami and Umesh Yadav chipped in with a wicket each. Earlier, skipper Virat Kohli (103) struck his 17th Test century that included five boundaries and one six, while opener Abhinav Mukund smashed 81. India posted 240-3 declared in their second innings to stretch their lead to 549 runs. India will now lock horns with Lanka in the second Test, beginning August 3 at Sinhalese Sports Club Ground in Colombo. Brief Scores: India 600, 240/3 (Virat Kohli 103 not out, Abhinav Mukund 81) beat Sri Lanka 291, 245 (Dimuth Karunaratne 97, Niroshan Dickwella 67, Ravichandran Ashwin 3/65, Ravindra Jadeja 3/71) by 304 runs.